Formed in 2006, Primitive Graven Image have established themselves in the black metal scene over the course of three internationally released albums and many well received tours and live dates, including the UK's Bloodstock and main supports to bands including Amon Amarth, Ethroned and Inquisition as well as headline UK tours. The band have moved from a very raw black metal sound on early releases to their later work with acclaimed producer Russ Russell (Napalm Death, Dimmu Borgir, Evile etc) which has also incorporated progressive and psychedelic influences.. Primitive Graven Image was formed in 2006 by guitarist brothers Rob and Luke Lehane, out of a love for the traditional black metal style. Immortal, Darkthrone and Emperor were the flavour of the day and a 6 track demo of spontaneous, infectious blackness was swiftly kicked into shape. With just two tracks uploaded their myspace page, the band were offered a record deal within six weeks, and signed to Pennsylvania based Open Grave Records who released the band’s completed demo as the 'Hellish Figurines; EP as a sign of things to come. The band’s debut album “Traversing The Awesome Night” was released shortly afterwards in May 2007 in the midst of the enthusiasm, provoking great responses from the black metal underground and beyond in the USA, Europe, Australia, and the UK alike, putting the band on the black metal map almost immediately. A live show of unrelenting fury was swiftly put together. Drummer Matt Platts, previously of the pre-Akercocke “Salem Orchid” line up, and more recently of Interlock and Empyreal Destroyer was recruited, to be followed shortly afterwards by Bassist Joshua Coxon, who took up the remaining five strings. The bands debut live appearance at Fusion festival in Chesham just a few weeks later on the seventh of the seventh, two thousand and seven - a truly magickal date - saw the band pull a huge crowd, winning them over with a set of warp speed blast beats, derranged groove, tribal fury and sheer intensity resulting in the band being invited back to headline a year later. With other choice gigs in the UK and Ireland including Cork Winterfest 2008 with Armon Amarth and Skyclad, and the UKs biggest metal festival Bloodstock Open Air 2009 with Carcass, Cradle Of Filth, Arch Enemy and many more the band began to slowly spread their dark vision further. Working now as a fully creative four piece, and beginning to expand on their black metal roots and discover their own sound, a second album began to take shape. 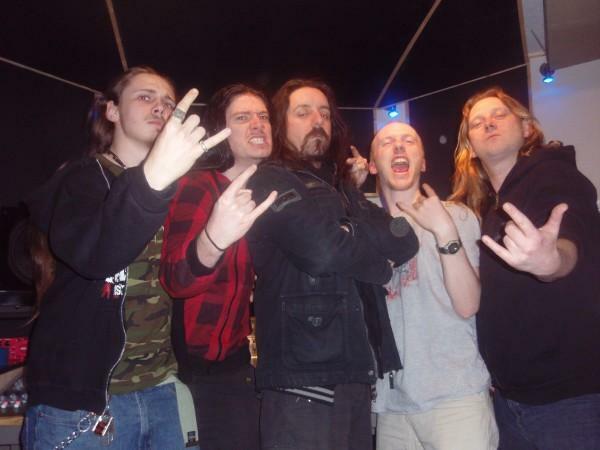 Beginning in Winter 2007, the band moved into Buckinghamshire's ‘Metal Farm Studios’ and new material was written, recorded, re written, re reordered, scrapped, programmed, mixed and remixed until the band caught the attention of Russ Russell (Napalm Death, Dimmu Borgir) and in January 2009 the album was taken to Parlour Sound studios in Northamptonshire for Russ to work his unique magic upon the recordings. After negotiating a deal with independent label Voiceprint (who have worked with a number of high profile bands over the years including Porcupine Tree, King Crimson, Yes and many 70's progressive rock acts amongst others), ‘Celebrating Impending Chaos’ was released in Europe on the Envenomation imprint in April 2010, and a month later in May 2010 for North America and Canada, with other territories including Japan and APAC following shortly after. The album was critically acclaimed by the metal press in Europe and America alike, receiving many 8 / 9 out of 10 reviews from major metal magazines as well as underground web zines. Live reviews and interviews followed from the likes of Metal Hammer, Terrorizer, Zero Tolerance, Decibel and may European magazines, as throughout 2010 and 2011 the band gigged up and down the country taking in festival dates such as London's 'Infernal Damnation' (with Alcest, Wodensthrone etc), Manchester's 'Show No Mercia' festival (with Winterfylleth), and main support tours with Abgott and Skaldic Curse. In early 2012 the band set about writing their third album. Pulling in yet more influences from progressive and psychedelic genres, and with some more death metal influenced sections beginning to creep in, the band's third album 'Psychedelic Episodes - Observations on Death and Deathlessness' was released on Sept 3rd. The band toured with European black metal legends Enthroned in spring of 2013, and with Eastern Front in the fall, along with playing a number of UK headline shows. Although 6 years since the release of the bands latest album, Primitive Graven Image have not stopped gigging in support of it. Mainly playing festival dates for the last few years, Primitive Graven Image remain fully cemented in the heart and mind of a now thriving UK black metal scene. The long awaited fourth album is in progress but will not be rushed - it will be ready when it needs to be.